Captain America will be redeployed. Marvel Studios and its parent Disney announced the sequel would be scheduled for release in April of 2014. 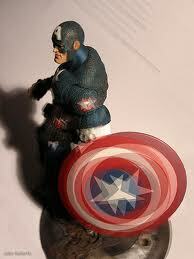 Captain America originated in the 1940s as a scrawny weakling who is chemically enhanced to become a super-soldier. He helped to save the world by helping the Allies during WWII. Marvel said in their announcement that the new sequel will start from where the upcoming May 4 The Avengers ends. What the means is that Captain America will in fact survive his ordeals in The Avengers. Samuel L. Jackson is scheduled to take on a more significant role in the sequel compared to just the short cameos he did in previous Marvel films. The studio would not release any further details about the sequel, not even what its title will be. Thor 2 another sequel from Marvel will appear in theatres before the second Captain America. It is due to be released in mid November of 2013. Star Chris Evans will most likely return as the super-hero soldier. The first film took in over $369 million worldwide. Thor, another Marvel release, took in over $449 million and even more is expected from its scheduled 2013 sequel. Jack Kirby and Joe Simon created Captain America, who on its first cover delivered a right hook to the jaw of Adolf Hitler. Joe Johnston the director of the first CA is expected to return to direct the sequel.